Research in Motion has revealed it is preparing six new BlackBerry smartphones to launch with its new mobile OS early next year, according to a report by Pocket-lint. Two of the new BlackBerry 10 smartphones will compete at the top-end of the market, with the remaining four covering the middle and lower end market segments. The Canadian phone maker gave the site a behind doors sneak peek to both of the flagship devices, though pictures were off-limits unfortunately. RIM is yet to name the models, but visually they appear to be the previously leaked London and Nevada models. Both handsets continue with the styling ethos that RIM is known for, with one sporting a traditional QWERTY keyboard design and a 720 x 720 pixel display, which we’re told looks similar to the current BlackBerry 9900 series smartphones, and the second using a touchscreen-only interface and a screen resolution of 1280 x 720 pixels. Pocket-lint spent around an hour with the two devices, and were shown several new features of BB10, as well as many of the applications. According to RIM, both are now finished products and are currently in testing with carriers and other selected partners. If all goes well, they should finish testing just before their release next year. RIM says it is on track for a Q1 2013 release of BB10, following two previous delays due to technical problems. 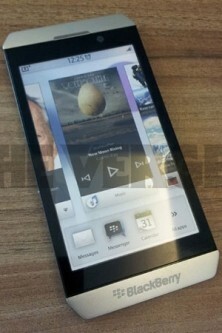 Originally, the phone maker had planned to release the QNX-based mobile OS at the beginning of this year. The first delay came last December, when RIM moved its launch to late 2012. Then in June, the company announced more job layoffs and re-scheduled it even further back to Q1 2013. More information will be revealed during the BlackBerry Jam Americas conference in San Jose later this month.